The idea of a Goods and Services Tax (GST) for India was first mooted sixteen years back and The Bill was passed by the Rajya Sabha on 3rd August 2016 and by the Lok Sabha on 8th August 2016. After ratification by required number of State legislatures and assent of the President, the Constitutional amendment was notified as Constitution (101st Amendment) Act 2016 on 8th September, 2016. The Constitutional amendment paved way for introduction of Goods and Services Tax in India. After the enactment of various GST laws, GST was launched with effect from 1st July 2017 by Sh.Narendra Modi, Hon'ble Prime Minister of India in the presence of Sh.Pranab Mukherjee, the then President of India in a mid-night function at the Central Hall of Parliament of India. Annual Return, Filed Once in a Year by All Assessee (Including Composite Dealers excluding Casual Taxable persons, ISD Dealers, Non-Residents Taxable persons, Persons paying TDS u/s 51 of GST Act), Consolidation of all reports of different tax heads i.e. 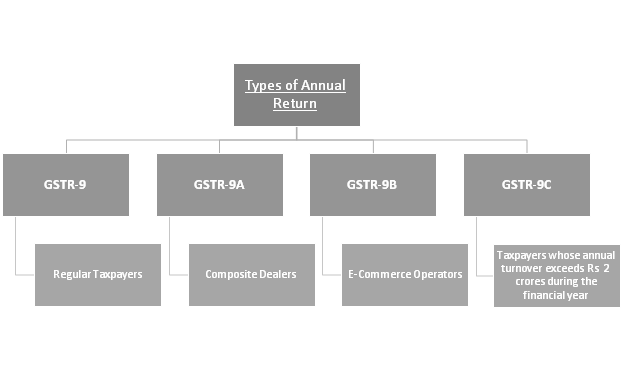 CGST, SGST and IGST. The Due date for the return is December 31 of the subsequent Financial year, So accordingly first GSTR-9 last date of filing is December 31 2018. · Liability of Statutory Audit ? · Date of Statutory Audit?